It's been a while since we've done an Advice For Adventurers post, so I figured it'd be fun to do a simple "day in the life" to give you a glimpse of what a random day looks like for us. I would say a normal day, but considering we've been pretty much on the move for over a month, we don't have normal days right now. So typically when we're camping in a new place each night, our days are semi planned out, with a starting point (where we woke up), an end goal (where we'd like to camp that night), and a few things we'd like to do or places we'd like to see in between. We like to be as flexible as possible because we never know what will come up or when our plans might change. For instance, we had been planning on hiking out towards Half Dome tonight (Wednesday) and summiting in the morning (Thursday) before driving 12 hours to Moab with the intention of getting there Friday afternoon, but something has come up and we want to be in Moab Friday morning for an event, so we're ditching Half Dome and spending today in Tuolomne Meadows with plans to camp in Mammoth area tonight (so we can get to Moab by tomorrow evening). See? Flexibility! So...here goes a ~normalnotnormal~ day in the life of Abbi and Callen. 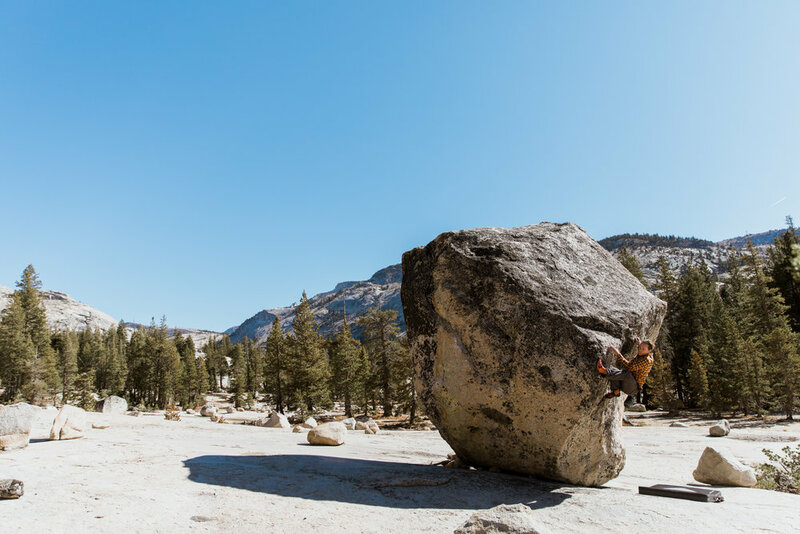 Goals: Explore Tuolomne Meadows, edit some photos (Abbi), do some bouldering (Callen), find a hot spring. 4:00am - For some reason I woke up and can't get back to sleep. Callen is still sleeping so I am typing out a few blog posts on my phone. No cell service so I can't do much else. 6:30am - UUUM Still haven't slept...it's going to be a long day. 7:00am - Woke up Callen. We got up and packed the camper while tourists took photos with the Yosemite sign less than 100 feet from our camp spot. They got the true Yosemite Experience. 7:15am - High-five the sign as we drive in eating cliff bars for breakfast. 7:29am - Stop at Fern Spring on our way into the valley to fill water bottles. 7:40am - Stopped at Sentinel Bridge to look at Half Dome. 8:15am - Took showers at Curry Village. 9:00am - Stopped at a pull out to get camera batteries out so we can charge them on the adaptor while driving Tioga Pass. 9:30am - Start driving up Tioga Pass to Tuolumne Meadows. Psyched because we haven't explore this section of Yosemite yet. 10:30am - Stop to find Sunrise Boulder. 10:36am - Found Sunrise Boulder. 10:55am - Callen sent a V2 on Sunrise. Heading back. 11:30am - Climbed on The Cube Boulder. Callen did 4 routes. 1:27pm - Made it through Tioga Pass to the 395! Breath of fresh air to be out of the crazy national park in the less-populated eastern sierras. 2:00pm - Drove up to Mammoth Ski Resort and stopped for lunch under a tree (crackers and peanut butter from our pantry). 2:27pm - Rolled into Mammoth Lakes. Checked out a few gear shops in town and asked for hotspring/camping/coffee shop recommendations. 3:46pm - I went to a local coffee shop for some caffeine since I woke up so dang early. 4:17pm - Stopping at Wild Willie's Hot Springs on our way down to Bishop. We've been here before when it was snowy and nighttime. Happy to be back during the day. We met a few new friends there and made sure to find them on instagram/facebook so we can stay connected. 6:01pm - Drive in to Bishop and hit two gear shops. Chatted with a few people before realizing we were super hungry. 6:45pm - Much to Callen's excitement, Bishop has a Little Caesar's INSDE k-mart. Welcome to the 90's. So we grabbed a hot & ready and about two slices in, it occurred to us that we really should've driven more today. We need to be in Moab by 9:30 Friday morning and we're 10 hours away (today is Wednesday.). SHOOT. So we look up places to camp free without getting murdered by clowns in Nevada (see recent news + the Wikipedia page for Tonopho, NV) and start driving. 7:46pm - Realize we're tired and are going to need some motivation for this drive. I grab my computer and a flash drive with Reel Rock 10 and we start watching through it for the billionth time. 9:30pm - Stopping in freaking Tonopho for gas. Getting out of here asap. The clown motel is JUST AS SCARY AS IT SOUNDS. 10:16pm - Back on the grind. Jamming to Justin Bieber to stay awake. Callen wanted to watch Futurama but our service is spotty so we can't load Netflix. 10:34pm - Needing motivation, we get the computer back out to watch another Reel Rock movie. 11:12pm - Back to Justin Bieber. We're almost to tonight's campsite. Hopefully this spot works out. 11:38pm - We have arrived at the campsite at Lunar Crater. I can't wait to sleep. This concludes a day in the life! Today ended up being a pretty crazy day, but so is almost every day. Now going to brush my teeth and sleep. Goodnight all! Honestly this seems super boring for someone to read but I am pretty proud of myself for keeping track of an entire day so I'm still going to post this. If you made it through...you're a good friend.